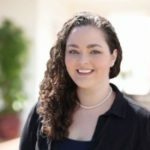 Mulch Volcanoes - How Much Mulch Is Too Much? 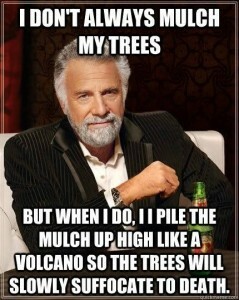 In this case piling up mulch around a tree forming what looks like a mulch hill or mulch volcano can severely hurt the tree. 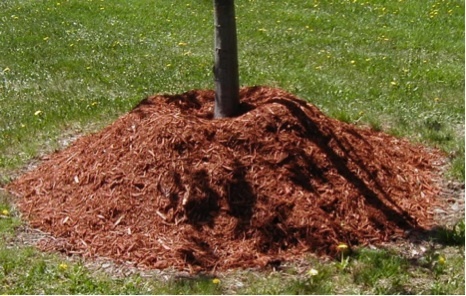 When mulch actually touches the tree, like it does in mulch volcanoes, moisture is trapped and penetrates the bark suffocating the cells that transfer food throughout the tree. This moisture is also a breeding ground for tree insects and disease. 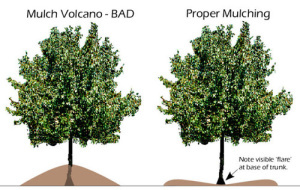 Mulch volcanoes can also keep water from reaching the roots of the tree (where water is needed). Do not pile the mulch against the trunk of the tree, keep the mulch 4″ away from the trunk, so that the root flare zone in visible. To refresh the look of mulch, lightly rake the top layers of the mulch, or simply remove the old mulch and replace with new mulch. Do not use fresh wood chips for mulching around young trees, fresh wood chips have a higher acidity and can injury a young tree. Previous DON’T LET YOUR TREES BECOME A NIGHTMARE!